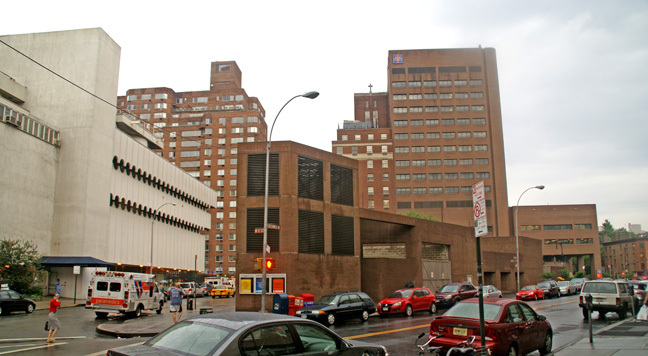 The Mount Sinai Medical Center is considering taking an interest in St. Vincent's Hospital in Greenwich Village, according to an article in the March 25, 2010 edition of The New York Times by Anemona Hartocollis. The article reported that Dr. Kenneth L. Davis, the president of Mount Sinai attended a quarterly meeting yesterday of the medical staff of St. Vincent's and said that "a deal had not been completed and that Mount Sinai would probably have to resurrect St. Vincent's medical residency program, which the hospital had been phasing out," adding that St. Vincent's "existing buildings would either be renovated from top to bottom or sold off." The article also noted that officials asked "residents who have been job-hunting to delay any moves to other hospitals for two or three weeks, in the hope that a deal could be completed." "Some of those involved in the search for a partner said that despite St. Vincent's financial problems -- it is $700 million in debt -- the hospital had some robust programs, like obstetrics, gynecology and orthopedics, as well as a cancer center, which could make it attractive to a partner," the article continued. St. Vincent's had been planning to expand by selling most of its properties on the east side of Seventh Avenue between 11th and 12th Street to the Rudins, who planned to develop residential condominiums there, and erect a new hospital on the site of the Edward & Theresa O'Toole Building that was originally erected for the National Maritime Union on the other side of the avenue. The plan met with considerable opposition from nearby residents and some preservationists. According to an article by Carl Campanile in the January 27, 2010 edition of The New York Post, "sources" have said that Continuum Health Partners, which operates Beth Israel, St. Luke's and Roosevelt hospitals in Manhattan, has submitted a plan to the New York State Department of Health to "assume control of the financially struggling, 727-bed St. Vincent's" Hospital in Greenwich Village, "the city's only remaining Catholic hospital." The article quoted "a source involved in the discussions" as stating that Continuum would "close all acute care" units such as surgical services and inpatient beds within 60 to 90 days. The article also said that sources maintained that "two holders of a combined $300 million St. Vincent's debt - GE Capital and TD Bank - support the Continuum takeover with the tacit approval of the state," adding that "State Health Commissioner Richard Daines previously served as CEO of Continuum's St. Luke's Hospital." The plan would convert St. Vincent's from a hospital to a community health center. St. Vincent's, which is 160 years old, occupies the western half of the block bounded by the Avenue of the Americas and Seventh Avenue and 11th and 12th Streets, and the eastern side of Seventh Avenue between 12th and 13th Streets, and the triangular block bounded by Greenwich Avenue, Seventh Avenue and 12th Street. The proposal would severely scale back St. Vincent's regional trauma and emergency center, according to the article, which added that "Continuum would continue to operate ambulatory care or outpatient treatment services at St. Vincent's, and possibly expand such services." The article noted that "he death of St. Vincent's would leave the lower West Side without a full-service hospital" and that the plan "was spelled out in a letter sent by Continuum CEO Stan Brezenoff last week to St. Vincent's board of directors." Kevin Finnegan, political director of 1199 SEIU United Healthcare Workers East, was quoted in the article as saying that "It would be outrageous for the state to even entertain offers to close the only hospital that services hundreds of thousands of New Yorkers who work or live on the West Side of Manhattan below 59th Street." The hospital recently received approval from the city's Landmarks Preservation Commission to proceed with its $1.6 billion modernization plan that included selling its properties east of Seventh Avenue for $300 million to the Rudin Company, which plans to redevelop those sites for residential condominium apartments, and razing the Edward and Theresa O'Toole Medical Services Building for a new hospital tower designed by Pei Cobb Freed Architects. The O'Toole Building is notable architecturally for its nautical motifs and had been designed by Albert Ledner for the National Maritime Union in 1964 and the hospital's decision to demolish it resulted in a major preservation controversy. Six leading preservation organizations filed a brief as amici curiae with the New York Supreme Court November 4, 2009 in a case challenging the hardship ruling by the city's Landmarks Preservation Commission authorizing the planned demolition of the O'Toole Building. In announcing its participation in the "friends of the court" brief, the Municipal Art Society said "By applying a test much more lenient than the courts have sanctioned, and inventing a campus-based exception to the Landmarks Law, the LPC has upset the finely tuned balance the law strikes between the rights and needs of non-profit property owners and the values of historic preservation. Even more disturbingly, the LPC's reasoning opens the door - far more than the Constitution requires - for non-profit owners of landmarks and buildings within historic districts to circumvent the requirements of the Landmarks Law." The new tower was reduced in the final approval by the landmarks commission about 40 feet in height to 286 feet and the tallest residential building designed by the Rudins by FXFowle was also lowered in height. St. Vincents Hospital is on the verge of another bankruptcy, its second in five years, and its 160-year history as the Villages full-service hospital appears to be ending, with the hospital facing a possible future as a community health center  with no acute care and limited emergency room service. Continuum Health Partners, the nonprofit group that operates Beth Israel Medical Center and Roosevelt and St. Lukes hospitals, has proposed to take over St. Vincents, close its Level 1 trauma center, send its acute care patients to other hospitals and operate it only as an expanded outpatient center. The move, with tacit approval of the State Department of Health, is an attempt to solve St. Vincents fiscal problems, including $700 million in debt and a monthly loss of between $5 million and $10 million, according to a New York Post article on Tuesday. St. Vincents worsening finances put in doubt its proposed $1.6 billion redevelopment plan with the Rudin Organization to build a state-of-the-art hospital on the west side of Seventh Ave. at W. 12th St. with residential development of its current buildings on the east side of the avenue to help pay for the new hospital. The Post article said that GE Capital and TD Bank, which hold $300 million in St. Vincents debt between them, support the Continuum plan. Elected officials, however, responded with pleas to the State Department of Health and St. Vincents not to let the full-service hospital close. In a joint letter, Council Speaker Christine Quinn, state Senator Tom Duane, Assemblymember Deborah Glick, Manhattan Borough President Scott Stringer and Congressmember Jerrold Nadler called on State Health Commissioner Dr. Richard Daines to hold off on approving the move until after reviewing the impacts on essential healthcare services. Assemblymember Richard Gottfried noted that St. Vincents was the primary admitting hospital after the World Trade Center attack in 2001. Stringer said that St. Vincents serious financial hardship should not be the only criteria for deciding the hospitals future. State D.O.H. Commissioner Richard Dainess connection to Continuum Health Partners raises serious concerns about potential conflicts of interest and only amplifies the need for a real public review and transparency on this proposal, Stringer said. Daines was chief executive officer of Continuum from 2002 to 2007, when he was named state Health commissioner three years ago; a department spokesperson noted that state law requires a two-year recusal by state officials from issues involving former employers. Any implication that [Daines] has a conflict of interest is wrong, said Claudia Hutton, the department spokesperson. The Manhattan borough president is welcome to join the department in its efforts to work with St. Vincents to find a solution, particularly if he can provide the $5 million to $10 million a month needed to keep St. Vincents operating, said Hutton. Continuum issued a statement that St. Vincents board had requested the proposal as an alternative to financial liquidation. If St. Vincents is able to continue to meet its mission on its own, they have our full support, the Continuum statement said. Jo Hamilton, chairperson of Community Board 2, said she was very concerned about the plight of St. Vincents. Our priority is to ensure that our local neighborhoods and all of Downtown Manhattan have the very best in healthcare services, Hamilton said. On April 6, 2010 the board of St. Vincent's Catholic Medical Centers voted last night to close its Greenwich Village facility. Alfred E. Smith IV, the chairman of the 160-year-old institution. said that "the decision to close St. Vincent's Hospital Manhattan inpatient services was made only after the board, management and our advisers exhausted every possible alternative." In an Apri. 7, 2010 article in The New York Times, Sharon Otterman wrote that "Gov. David A. Paterson said Tuesday he would work with the board and the Department of Health to preserve some of the hospital's most important community functions, perhaps by scaling it down to an urgent care center that could take patients with conditions ranging from ankle sprains to heart attacks." "That plan would also try to maintain some outpatient services, like those that provide H.I.V. treatment and primary care, but it remains at a conceptual stage and would require finding a partner, people close to the process said," the article continued. "To satisfy its creditors, the hospital my sell or lease much of its valuable Greenwich Village real estate, as it drastically reduces its staff of doctors, nurses and others, to repay its estimated $700 million of debt," the article said, adding that "with vastly reduced services, it would no longer be a Level trauma center, so patients with high-level emergencies would be routed to full-service hospitals." Continuum Health Partners and Mount Sinai Hospital both separately studied potential partnerships recently with St. Vincent's but withdrew their proposals. William Rudin of Rudin Management which has been negotiating with St. Vincent's Hospital to redevelop part of its Greenwich Village campus into luxury residential condominiums said that the recent announcement by the hospital that it would be closing most of its operations does not spell the end of redevelopment plans there, according to an article by Paul Rubny yesterday at GlobeSt.Com. 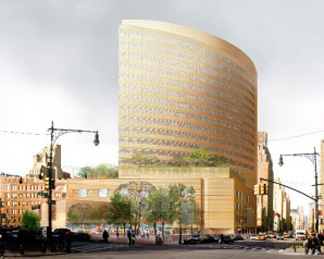 His real estate company and St. Vincent Catholic Medical Centers had agreed in 2007 to build a larger, inpatient facility on the west side of Seventh Avenue between 12th and 13th Streets on the site of the Edward & Theresa O'Toole Medical Services Building and the redevelop many of its facilities across the avenue between 11th and 12th Streets. In the article, Mr. Rudin said that "The Rudins are committed to working with all of the stakeholders to come up with a viable alternative plan to create an appropriate healthcare facility and to continue with the development on the east campus," adding that "We're waiting for the state to issue their RFP that would outline what they're looking for in terms of a new healthcare facility for St. Vincent's. When we all see that, we'll analyze it." The article said that Mr. Rudin said that it is not certain when the request for proposals by the state will be issued, but he added that "the plan for St. Vincent's to sell his company eight of its buildings for $310 million, four of which would be razed and replaced by an apartment tower and some low-rise townhouses, was not changing": "We have Landmarks Preservation Commission approval for our plan to put up four new buildings. We think that's still viable." In a statement, the article continued, the St. Vincent's board says its vote will be followed by submission of a closure plan to the state Department of Health. Pursuant to the plan, all St. Vincent's patients will be "discharged or transferred to nearby non-affiliated hospitals, as appropriate," according to the statement.